You can use a standard PC keyboard with your Chromebook. This means that any USB keyboard will work with a Chromebook just as it would on a Windows or mac. Just like adding a wireless Chromebook mouse, you can plug in or connect any USB or Bluetooth keyboard to your Chromebook and it will work fine for most purposes. Read more about some of the best ChromeOS Keyboards from Chromebooks and Chromeboxes. Many users like the ChromeOS keyboards and they are decently designed keyboards. Many users though will be fine with a standard PC keyboard on their Chromebase, Chromebox, or Chromebook. 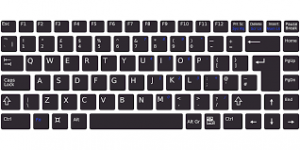 When using a standard PC keyboard, remember that Chrome OS uses a non-standard keyboard layout, with special keys in replacement of the function row and some switches elsewhere. The big change is having a search key instead of caps lock. While you can use any keyboard you have laying around, you should consider a Chrome OS-specific keyboard if you’re going to buy a new keyboard anyway. How are Chromebook keyboards different? Just like a USB mouse, Chrome OS can handle USB keyboard the instant you plug them in. No need for drivers or other software. A few different manufacturers make Chrome OS layout wired keyboards, like Dell and Asus. There are a few things to remember if you continue to use a standard PC keyboard with ChromeOS. When using a standard PC keyboard with your Chromebook Windows® start key acts as the search key on a Chromebook. F keys trigger the Chromebook hotkeys. F1 = back F2 = forward F3 = refresh F4 = full-screen, etc. Connecting a Bluetooth keyboard to a ChromeOS computer is also very easy and is just like connecting a mouse. You’ll have to put the keyboard into a pairing mode, open up Bluetooth settings on your Chromebook and then select the keyboard from the list of available devices. You’ll be prompted to type a sequence of numbers on the keyboard, and press enter to pair. There are also a selection of wireless keyboards out there with Chrome OS keyboard layouts. Chromebook is the everyday, everybody computer, and Logitech offers a wide range of every purpose accessories. Navigating, typing, or listening, we have an accessory to help you.